This was an experimental build testing materials and construction techniques. The entire project was made from wood I had on hand. I mixed up the woods to see how the paint would work with the different woods. 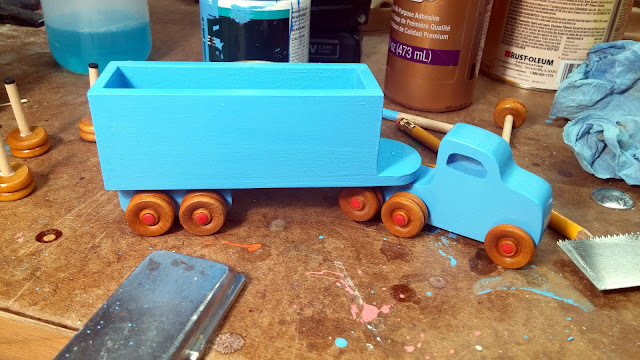 I came up with the trailer design after giving my grandson the first truck with a flat bed and the first thing he did was try to haul a car on the flat bed. It rolled right off. Blocks didn't stay on much better. The box bed is made from Southern Yellow Pine left from a previous Toddler Rocking Horse Project. The trailers under carriage is made from spruce and the cab is whitewood. The wheels are 3/4 birch purchased from Craft Parts. 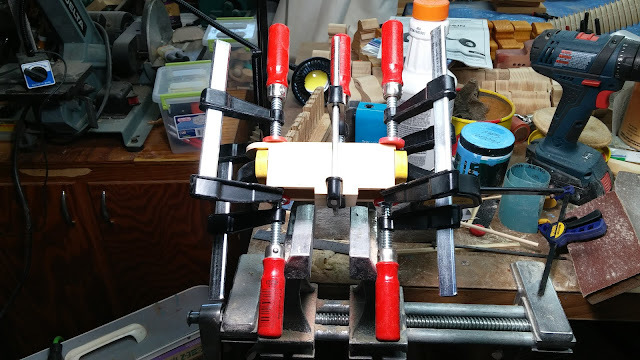 The axles are cut from birch dowels. The finish is Behr Oops Paint from Home Depot purchased for $0.50. I applied it using a brush on bare wood. There are two coats of paint with a light sanding in between coats to remove the fuzzies. The wheels are finished with one coat of amber shellac and the axle ends are finished with red acrylic craft paint. The toy truck was turned over to my grandson for QA stress testing.